Building operations consume 39% of the energy in the U.S. and HVAC gobbles up a big part of that. However, 9 out of 10 commercial buildings fail to meet fundamental conditions for acceptable comfort and energy efficiency. Air conditioning contributes Fifty percent of the demand for power during peak periods in California and 70 percent of the power in Dubai. Peak power typically comes when air conditioners are cranking their hardest. The percentage of homes with air conditioning rose from 27 percent in 1980 to 55 percent in 2001. Worse, the air conditioners come on during the hottest days in the year en masse, when power is at its peak price and brown-danger looms. Industry experts say most all buildings have more chiller and heat capacity than they need. While a car has hundreds of control points for just one or two people, buildings typically have only one thermostat for 10 or more workers. It’s no wonder occupants consistently report that their workspace is too hot, too cold, stuffy, drafty. Absorption Chiller - A refrigerator that uses a heat source to provide the energy needed to drive the cooling system. Absorption refrigerators are a popular alternative to regular compressor refrigerators where surplus heat is available (e.g. combined heat and power (CHP) or industrial processes). A compressor refrigerator uses an electrically-powered compressor to increase the pressure on the gas, and then condenses the hot high pressure gas back to a liquid by heat exchange with a coolant (usually air). Once the high pressure gas has cooled, it passes through a pressure release valve which drops the refrigerant temperature to below freezing. An absorption refrigerator changes the gas back into a liquid using method that needs only heat, and has no moving parts. A compressor refrigerators typically use an HCFC, while absorption refrigerators typically use ammonia. Air Velocity - The speed of moving air. Some air movement is desirable. A little air movement will provide a cooling sensation. Too much air movement is annoying and distracting. Chiller and/or Boiler Optimization – For facilities with multiple chillers and/or boilers, the most efficient units are selected to meet the existing load with minimum demand and or energy. Chiller Demand Limiting – The chiller electrical load is reduced at certain times to meet a maximum pre-specified chiller kW load. DCV – Demand Controlled Ventilation - DCV saves energy by ensuring that the proper amount of mechanical ventilation is supplied by continuously monitoring spaces and occupancy conditions by measuring CO2 concentrations. Significant energy can be saved when used in conjunction with typical VAV designs. Demand Limiting – Temporarily shedding electrical loads to prevent exceeding a peak value. Requires frequent attention. DOA – Dedicated Outside Air -Decoupling ventilation from heating/cooling can allow both to be optimized separately. Duty Cycling – Shutting down equipment for predetermined short periods of time during normal operating hours. EMS – Energy Management System – BAS that focuses on reducing energy use. Economizer - Mechanical devices intended to reduce energy consumption. In simple terms, an economizer is a heat exchanger. Air-side economizers can save energy in buildings by using cool outside air as a means of cooling the indoor space. Temperature control is achieved by mixing return air from the building with the outdoor air to achieve the desired mixed air or supply air temperature. In most cases, the process requires some sort of relief system to allow the excess air brought into the building to exit without creating a pressurization problem. The process must also be coordinated with the ventilation requirements to ensure that there is always enough outdoor air brought into the building to meet the ventilation requirements. In addition, the control of the process must be coordinated with the other heat transfer elements in the system like the preheat coil and cooling coil to prevent energy waste. When the outside air is both sufficiently cool and sufficiently dry, the amount of enthalpy in the air is acceptable to the control and no additional conditioning of it is needed. This portion of the air-side economizer control scheme is called free cooling. Air-side economizers can reduce HVAC energy costs in cold and temperate climates while also potentially improving indoor air quality, but are most often not appropriate in hot and humid climates. It is commonly held that raising outdoor air flow rates to accommodate indoor air quality needs will dramatically increase energy use because this increased outdoor air must be conditioned. However, this conventional wisdom ignores the dynamics of energy use of different systems during different seasons. With the appropriate controls economizers can be used in climates which experience various weather systems. emissivity. Most building materials have an emissivity around 0.90. Enthalpy - A partial measure of the internal energy of a system. Enthalpy cannot be directly measured, but changes in it can be. If an outside pressure on a system is held constant, a change in enthalpy entails a change in the system's internal energy, plus a change in the system's volume. Exfiltration - Exfiltration: Air that is expelled from a building through cracks and openings in the envelope by a positive pressure in the building relative to the atmosphere. Generally, exfiltration is considered desirable as long as it is not excessive, especially in contrast to infiltration. Air that is expelled from a building through cracks and openings in the envelope by a positive pressure in the building relative to the atmosphere. Generally, exfiltration is considered desirable as long as it is not excessive, especially in contrast to infiltration. Freezestat - A safety device used to protect water and steam coils that are not designed to deal with subfreezing air from exposure to such by shutting down the air handling system and closing any outdoor air dampers. Manual reset is typically required and a hard wired installation is highly desirable. Global Temperature Adjustment –The practice of increasing the cooling set point and decreasing the heating set point, thereby relaxing the lower and upper limits of the set point deadband. Migrating to State Energy Code. HDD - Heating Degree Days - Quantitative indices designed to reflect the demand for energy needed to heat a home or business. These indices are derived from daily temperature observations, and the heating requirements for a given structure at a specific location are considered to be directly proportional to the number of HDD at that location. A similar index, cooling degree day' (CDD), reflects the amount of energy used to cool a home or business. HDD are defined relative to a base temperature - the outside temperature above which a building needs no heating. HDD are often made available with base temperatures of 65°F (18°C), or 60°F (15.5°C) One popular approximation method is to take the average temperature on any given day, and subtract it from the base temperature. If the value is less than or equal to zero, that day has zero HDD. But if the value is positive, that number represents the number of HDD on that day. Hot Deck/Cold Deck Temperature Reset - Selects the zone/area with the greater heating and cooling requirements, and establishes the minimum hot and cold deck temperature. IEQ - Indoor Environmental Quality, of which IAQ (Indoor Air Quality)is a component, also includes the impact of temperature, lighting, sound and other environmental issues. Inhabitant – User of the building’s controls. Readily usable control interface. The ususal phrase “occupant” indicates passivity, building controls invisible. Maintenance Management – Provides a maintenance schedule for utility plants, mechanical and electrical equipment based on run time, calendar, physical parameters. Lockouts – Ensure that equipment does not come on unless it’s necessary. They protect against nuances in the programming of the control system that may inadvertently cause equipment to turn on. For example, a chiller and its associated pumps can be locked out according to calendar date, when the outside air falls below a certain temperature or when building cooling requirements are below a minimum. Make-up Air - Air that is brought into the building by a fan system to replace air that is exhausted by a process like a kitchen exhaust hood or a lab hood. In some instances, it is simply included in the minimum outdoor air setting of the fan system serving the area. In other instances, it is addressed by a separate system dedicated to the function. The latter approach has the advantage of allowing operating economy to be achieved because the make up and exhaust processes can be cycled based on the function they serve independently from the comfort conditioning HVAC processes in the area. This is especially common in the case of kitchen hoods. MAU - Makeup Air Unit - An air handler that conditions 100% outside air. MAUs are typically used in industrial or commercial settings, or in "once-through" (blower sections that only blow air one-way into the building), "low flow" (air handling systems that blow air at a low flow rate), or "primary-secondary" (air handling systems that have an air handler or rooftop unit connected to an add-on makeup unit or hood) commercial HVAC systems. MET Units - Metabolic Rate. HVAC requirements differ depending on how a building is used. Most comfort standards use a Met rate around 1.2. Minimum Outdoor Air - The outdoor air that must be brought into the system to handle the ventilation requirements of the building. This amount may vary with building use and the system operating conditions (either intentionally or unintentionally) or may be fixed any time the system is in operation (again, either intentionally or unintentionally). Maintaining the proper minimum outdoor air quantity is crucial in terms of ensuring proper indoor air quality, proper inter-space pressure relationships, and proper building pressurization. It is directly related to meeting code enforced ventilation requirements and may include make up air associated with various processes like kitchen hoods and lab hoods. MRT – Mean Radiant Temperature - The average temperature of all surrounding surfaces. Comfort is not just air temperature. The radiant temperature of surfaces around you, air velocity, relative humidity, activity and clothing all make a big difference. You can be comfortable in a 78 degree room if some surfaces are 65 degrees. 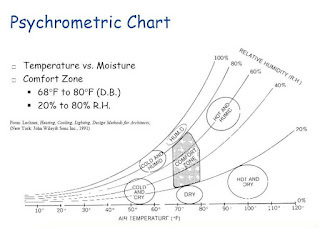 Psychrometric Chart - A graph of the physical properties of moist air at a constant pressure (often equated to an elevation relative to sea level). The chart graphically expresses how various properties relate to each other, and is thus a graphical equation of state. PTAC - Packaged Terminal Air Conditioner – An air conditioner and heater combined into a single, electrically-powered unit, typically installed through a wall and often found in hotels. Reheat – Cool to 55 for dehumidification, reheat to what the room needs. Reheat Coil/Reset – Selects the zone/area with the greatest need for reheat, and establishes the minimum temperature of the heating hot water so that it is just hot enough to meet the reheat needs. Relief Air - Air which is expelled from the building having been brought in by an economizer cycle. Relief Fan - A fan which is applied in conjunction with an economizer cycle and located in the relief path from a building, not to be confused with a return fan. Relief fans are applied when the return path from the occupied zone to the air handling unit has an insignificant pressure drop (thus requiring no return fan) but the restrictions in the relief path to the building exterior would cause the building to become over-pressurized when the economizer cycle was operating on high percentages of outdoor air if no fan were provided. Remote Boiler Monitoring and Supervision – Uses sensors at the boiler to provide inputs to the EMCS for automatic central reporting of alarms, critical operating parameters, and remote shutdown of boilers. Resets – When equipment operates at greater capacity than necessary to meet building loads, it wastes energy. An EMS can allow equipment to operate at the minimum capacity required by resetting operating parameters. The traditional design practice is to use a proportional reset schedule based on outdoor temperature. Although that method works reasonably well, a more effective method is to base resets directly on building loads. Exponential Reset - Temperature increases faster in the beginning and slower in the end. Return Fan - A fan which is applied in an air handling system when the restrictions in the return air flow path from the occupied zone to the air handling unit would cause the building to become overpressurized. Without a return fan, the supply fan must pressurize the occupied zone to a value that is high enough to overcome the return path restrictions. If this pressure exceeds 0.10 – 0.15 inches w.c., a variety of problems can ensue, including a reduction in supply flow and doors that are blown open. RTU – Roof Top Unit – A packaged air-handling unit, defined as either "recirculating" or "once-through" design, made specifically for outdoor installation. They most often include, internally, their own heating and cooling devices. RTUs are very common in some regions, particularly in single-story commercial buildings. Scheduled Start/Stop – Starting and stopping equipment based upon the time of day, and the day of the week. SEER - Seasonal Energy Efficiency Ratio - Measures BTU of cooling/watt. Higher SEER = more efficiency Old systems typically around 7 – 10, newer ones up to 15. Worst one you can buy today is 13. Setpoint - The target value that an automatic control system controller will aim to reach. Setback - To save energy, the temperature inside public buildings is allowed to fluctuate after business hours by lowering the space heating setpoint or raising the space cooling setpoint. Stack Effect - (aka chimney effect) - The movement of air into and out of buildings, chimneys, flue gas stacks, or other containers, and is driven by buoyancy. When the building is warmer than the ambient environment, the air in the building is less dense than the air outside at ground level. Thus, outdoor air tends to enter the building through cracks and open doors on the lower levels. This air then moves upward through the building via shafts and other vertical openings, and exits the building through cracks and openings in the upper levels. The flow pattern reverses during the summer months when the temperatures inside the building are cooler than the ambient environment. The stack effect helps drive natural ventilation and infiltration. Static Pressure - The pressure in a duct system. This pressure is similar to our blood pressure. In this case the system fan (also known as the blower) creates the pressure, instead of the heart. High static pressure can cause low airflow. SWAC - Sea Water-based Air Conditioning - Uses cold seawater near coastlines to supply air-conditioner coolant, could significantly reduce electric utility loads during high summer demand periods. SWAC is a proven technology currently used in Hawaii, Stockholm and Ottawa. Thermal Comfort - Dependant primarily on the following six factors: air temperature, mean radiant temperature, air movement/velocity, relative humidity, activity levels, and the isolative properties of clothing. Thermal Mass - Material within a building, such as concrete or brick, that absorbs and holds heat, lessening energy costs. Building thermal mass can be used to reduce the peak cooling load. For example, in summer, the building mass can be pre-cooled during non-peak hours in order to reduce the cooling load in the peak hours. As a result, the cooling load is shifted in time and the peak demand is reduced. The building mass can be cooled most effectively during unoccupied hours because it is possible to relax the comfort constraints. Thermal Zone - A single or group of neighboring indoor spaces that the HVAC designer expects will have similar thermal loads. Building codes may require zoning to save energy in commercial buildings. Zones are defined in the building to reduce the number of HVAC subsystems, and thus initial cost. For example, for perimeter offices, rather than one zone for each office, all offices facing west can be combined into one zone. Small residences typically have only one conditioned thermal zone, plus unconditioned spaces such as unconditioned garages, attics, and crawlspaces, and unconditioned basements. Tons – Cooling capacity is rated in tons. Equivalent to a ton of ice. 1 ton = 12,000 BTU per hour. Typically, a window unit is under 1 ton, central home AC is 1 to 3 tons and commercial is over 3 tons. U-value - (or U-factor), more correctly called the overall heat transfer coefficient, describes how well a building element conducts heat. It measures the rate of heat transfer through a building element over a given area, under standardized conditions. The usual standard is at a temperature gradient of 24C, at 50% humidity with no wind (a smaller U-value is better). VAV – Variable Air Volume – Technique for controlling the capacity of a HVAC system. An air handling system wherein the supply flow varies as a function of some process requirement. Usually the driving requirement is cooling load, but systems where the volume varies as a function of the heating load or pressurization requirements can also be found. In load driven applications, varying the flow can have a major impact on the energy required to serve the process on several fronts. Fan energy is saved because the amount of air moved varies with the load. This is a powerful, non-linear relationship and all other things being equal, a 25% reduction in flow translates to a 58% reduction in fan horsepower. The need in most systems to maintain some fixed discharge pressure at the inlet to the terminal units detracts from this some, but there are still significant savings to be realized. Control energy is saved in most applications since the need for less capacity is matched by a reduction in available capacity. This is in contrast to constant volume system approaches like reheat, multi-zone, or double duct where the need for a reduction in capacity is addressed by imposing a false load on the system. For instance a constant volume reheat system operating at part load eliminates unnecessary cooling capacity by heating the supply air at the terminal location with a reheat coil. HVAC process energy is saved at the air handling system since the flow through the heat transfer equipment is reduced with load. Dehumidification is greater with VAV systems than it is with constant volume systems which modulate the discharge air temperature to attain part load cooling capacity. Control of the system's fan capacity is critical in VAV systems. Without proper and rapid flow rate control, the system's ductwork, or its sealing, can easily be damaged by over-pressurization. Includes reheat coil, fan. A BAS could reset VAV static pressure by scanning all the VAV damper positions and gradually changing the static pressure until only one damper was completely open. At that level of static pressure the fan draws the least amount of power required to distribute sufficient air to all the boxes. Stand alone controllers usually cannot rest static pressure in this manner because they typically have no way of sensing VAV damper position. (also called an Inverter): Variable Frequency Drive; a variable speed drive technology that varies the speed of an alternating current (a.c.) motor by varying the frequency of the ac power applied to it. In general terms, the drive circuitry rectifies the incoming a.c. utility power into pulsed direct current (d.c.; hence the term inverter), modifies the frequency and voltage, then coverts the power back to a.c. for use by the motor. There are a variety of technologies used to accomplish the rectification and wave form modification. VAV often provide too little outside air on normal days. VFD – Variable Frequency Drive (also called an Inverter)a variable speed drive technology that varies the speed of an alternating current (a.c.) motor by varying the frequency of the ac power applied to it. In general terms, the drive circuitry rectifies the incoming a.c. utility power into pulsed direct current (d.c.; hence the term inverter), modifies the frequency and voltage, then coverts the power back to a.c. for use by the motor. There are a variety of technologies used to accomplish the rectification and wave form modification. Motors provide power for pumps and fans for the heating and cooling of buildings. Only a small percentage of large motors are controlled by variable speed drives as opposed to traditional fixed drives which run at full speed all the time. A U.S. motor challenge study indicated that 85 billion kilowatt hours (kWh) per year could be saved using variable drives and high-efficiency motors. A variable speed drive can reduce a motor’s energy consumption by as much as 60%. Warm Up/Cool Down Ventilation & Recirculation – Controls operation of the Outside Air dampers when the introduction of OA would impose an additional thermal load during warm-up or cool-down cycles prior to occupancy of a building…often poorly executed. Smart sensors can identify overcycling wears out machinery and wastes energy. A Smart Grid is a key enabler in integrating smart building controls with the goal of peak reduction. For commercial and industrial customers, an energy management system linked to a system of internal sensors and controllers can leverage the continual load and rate structures to allow both demand response operations and demand bidding operations. Testing is under way on using web services to integrate BAS’s with utility systems which would implement control strategies based on real-time pricing. Energy storage is another mechanism to optimize building energy usage in response to real-time pricing (RTP) signals. The RTP system provides the pricing schedule through email or direct transfer to the Building Automation System that can perform the necessary activities to optimize the building energy usage. Because electrical demand charges can make up 40% of a utility bill, many building automation systems have demand limiting or load shedding functions. For example, when the demand on a building meter or piece of equipment, such as a chiller, approaches a predetermined setpoint, the BAS does no allow the equipment to load up any further. Another way to minimize peak demand is to program time delays between the start-up of major pieces of electrical load equipment, so several pieces of equipment do not start up at the same time. Global-zone temperature set point adjustment is an ideal DR strategy for HVAC systems with direct digital controls. The acceptability of set point adjustment strategy depends on how much, how fast, and how often it is executed, as well as other occupant related issues such as occupants’ preparation and the information provided to them. Finally, decoupling ventalation from heating/cooling can provide the opportunity to optimize both systems rather than making compromises in each. Cost Savings – Simulation results and field tests confirmed tests increasing the zone temperature set-point by four degrees can reduce chiller electricity consumption by about 33% and HVAC electricity consumption by about 25% over a four hour shed, even on hot days. 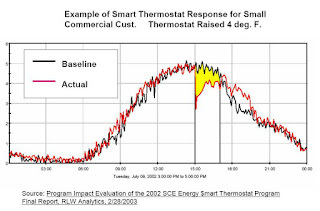 The results also indicate the value of pre-cooling in maximizing the electrical shed in the on-peak period. By lowering the zone temperature by two degrees in the morning off-peak period, the on-peak shed resulting from raising the set-point by four degrees is increased by about 50%. Whether or not pre-cooling is used, the dynamics of the shed need to be managed in order to avoid charging the thermal capacity of the building too quickly, resulting in high cooling load and electric demand before the end of the shed period. An exponential trajectory for the zone set-point during the shed yielded good results. Tends to be short of resources with many responsibilities. Rarely understands past, current or future energy markets. Lacks the ability to quantify demand reduction and the prerogative to execute these strategies if there are potential negative consequences. Unempowered Inhabitants - When people feel in control of their environment, they feel more pleasure, comfort, productivity and have more tolerance for less than ideal conditions. Leave system in switched state, do what is most convenient and easiest. Insulative Properties of Clothing - The socially/culturally acceptable clothing styles that we grow up with, which are part of the norms we learn from our family, peers, schooling, company policies, and the mass media, and which vary by activity/task/job description, gender, age, class, and culture, are part of what generate the experience of being thermally comfortable in a given situation. There may be thermal comfort conflicts among different demographic groups possessing different clothing norms (and therefore different insulative values of dress) — including the classic modern conflict between male and female office workers. Inefficient Design - Peak energy use is further amplified by the natural tendency of designers and contractors to provide a larger capacity system than necessary, resulting in excessive and inefficiency cycling of the compressor. 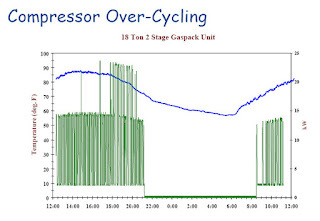 Increased cycling of a direct expansion air conditioning system reduces overall efficiency through cycle start-up losses which occur until the cold liquid refrigerant returns to the evaporator coil. The results of over sizing single-speed units include increased electric peak and, in some cases, increased energy consumption. The HVAC industry and market will be transformed to ensure that its energy performance is optimal for California. California should investigate a new efficiency metric for residential and nonresidential direct expansion, air cooled air conditioning system that appropriately rates performance in hot and dry California climate zones. Chromasun - Sausalito CA - Ausura Founder Developed a solar air conditioner from Ausra co-founder Peter Le Lievre. Heat is captured with a rooftop device similar to a solar thermal power plant. The heat is then used, instead of natural gas, to boil a refrigerant in a solution in a sealed chamber. Through heat exchangers and manipulating the pressure inside the sealed chambers, the refrigerant is re-condensed into a low-temperature liquid and employed create cold air. The evaporation-condensation cycle goes as long as the sun provides enough heat. Chromasun's device is 75 percent efficient. The device – at 10 foot by 4 foot sealed box – is essentially a utility scale solar thermal plant and a utility-scale concentrating solar PV plant in miniature. It contains mirrors, receivers and a concentrator for generating solar thermal energy as well as silicon solar cells. Ice Energy, Windsor, CO - Provides distributed energy storage and smart grid solutions for optimizing energy system efficiency through peak load management and integration of intermittent, renewable resources onto the grid. Pairing its Ice Bear energy storage module with a standard commercial air conditioner, Ice Energy delivers the industry's first hybrid cooling solution specifically developed to reduce air conditioning energy demand for small to mid-sized commercial businesses. With $63 million of VC funding raised since 2005, and Goldman Sachs as a backer, the company is probably thinking of an IPO. Optimum Energy LLC, Seattle, WA - Makes software (and some hardware) for controlling the chillers inside skyscrapers. Optimum has devised a software-as-a-service system that monitors and controls the chilling systems, which provide the water for air conditioners in large buildings. Control systems for water chilling have existed for years, but often go for overkill. The systems are geared towards keeping the water at a relatively steady 44 degrees, and they keep the flow rate about the same. That means on moderately warm days, more cool air is produced than is required, leading to super chilly rooms or ejected cold air. In Optimum's system, the water temperature can rise without impacting the temperature inside the building. Depending on environmental conditions and occupancy, the software can reduce the number of pieces in operation at any given time and also reduce the power going to the machinery in operation. Trend data is also collected, which can be used to anticipate equipment failure. The water temperature is ultimately set by an algorithm that analyzes current data on pressure, flow, ambient termperature, water temperature, occupancy, history and other factors. Radio Thermostadt Company of America - San Francisco - In 2010 Radio Thermostadt expanded to the holy grail of home improvement retail: Home Depot. Ecobee and iThermostat both offer similar products, but Radio Thermostat is hoping the price of $99 and space on the shelves of one of the nation’s largest retailers will compel the masses to pick up its product. “The 'programmable' got you part of the way there, but no one lives in a Leave it to Beaver household anymore,” said Dan Goodman of Radio Thermostat Company of America. Instead, people need a device that is easy and user-friendly, as well. The product, sold under the 3M Filtrete brand, isn’t that different from others on the market, and one could argue it’s even a little more simplistic in terms of its touch screen and offerings. However, Ecobee retails for nearly $500 in the U.S., and while iThermostat is free, that is only through a utility partner. The thermostat’s website, which is free, and requisite iPhone app, are both simple to use. The interface is less than flashy, completely utilitarian, and easy to understand. For now, it is just a place to adjust the temperature of the thermostat, as opposed to a home energy management portal. Smartcool Systems Inc (TSXV: SSC) - Vancouver, BC - Specializes in energy and cost reduction technologies for the HVAC and refrigeration systems of commercial, industrial and retail businesses. The Smartcool product line of green technologies reduces the electricity consumption (kWh) and demand (KW) of air conditioning and refrigeration compressors. Agorithms that optimize the compressor in commercial or residential air conditioners, the component that can account for up to 70 percent of the power consumed by some systems. More than 26,000 of its energy saving modules have been installed. Smart Cool Systems has been around for nearly 20 years and is still small. Transformative Wave - Kent, WA - Since 2009, Transformative Wave has been committed to developing, and bringing to market a growing line of energy saving and environmentally responsible solutions to address deficient packaged HVAC rooftop units (RTUs). Transformative Wave’s CATALYST is a RTU Retrofit solution that reduces HVAC energy usage by 25 – 50% and the recognized leader in RTU optimization and control. The CATALYST is more than a controller and more than a variable frequency drive (VFD). It is a complete HVAC energy efficiency upgrade that includes numerous components, adds 5-6 new sensors and has been developed as an easy-to-install pre-wired kit. When applied, it radically lowers the energy use and improves the overall performance of constant volume HVAC systems. The CATALYST assures proper ventilation, maximizes the use of outside air for free cooling beyond standard economizer logic, and reduces fan energy use by an average of 69%. U.S. Environmental Protection Agency report, "Energy Cost and IAQ Performance of Ventilation Systems and Controls"
I really liked your web page, you present some really decent information on this blog site. Your article is written very articulately and gives a very good explanation about commercial hvac repair . Great post! This article should be read over and over again. This blog contains a lot of vital information which can help me a lot.Thanks for sharing it.